Delivering on the client’s brief to ensure local people’s views are included in developing a town masterplan, and the need to ensure this engagement is moderated, managed and reported. 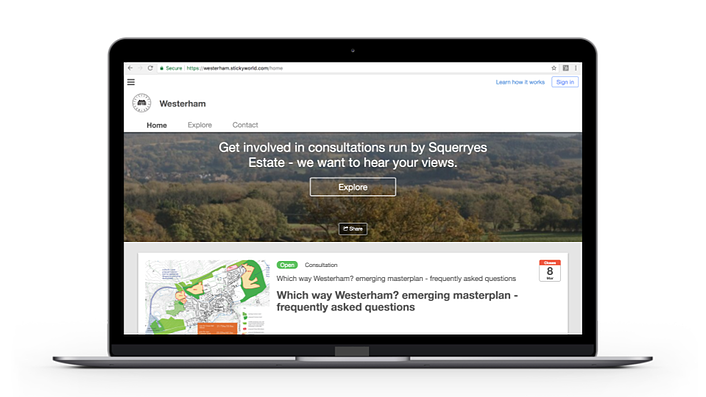 A series of successive, time-limited and carefully managed public consultations published on the Westerham Stickyworld portal, enabling public and private feedback to inform the masterplan. A modern, efficient, transparent approach to gathering feedback from the entire community to meet the client’s expectations. The means to manage and moderate public engagement and deliver an audit trail of consultation and decision-making. Senior Landscape Architect and Urban Designer for Rummey Design. 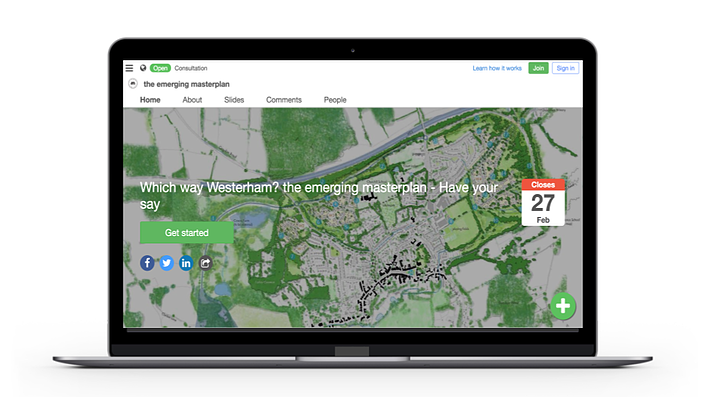 Masterplanners and Urban designers, Rummey Design, set up the Westerham Stickyworld portal in February 2017 on behalf of their client, Squerryes Estate. The estate own much of the land in and around the town of Westerham. Rummey Design was engaged to develop the town's new masterplan requesting the involvement of local people. Stickyworld software provided Rummey Design a modern and transparent way of meeting its client's requirements, and the means to manage engagement in different ways to suit the various stages of the project. The Rummey Design team ran a sequence of time-limited consultations to share information, collect and evidence the local community’s ideas about their aspirations for Westerham. As a result, important views or objections have been captured and an audit trail of consultation and decision-making has been created. The team continue to use Stickyworld moving into 2018. Squerryes Estate is a major landowner in Westerham, a historic town 5 miles from Sevenoaks in Kent, UK. In early 2017 the estate started the complex process of devising a long-term plan to grow and improve the town for the next 100 years. At the same time, Sevenoaks District Council began developing its Local Plan to shape development across the entire Borough for the next 30 years. A new masterplan for Westerham provided an opportunity for the town to participate and influence the Local Plan and its outcomes. Squerryes Estate asked Rummey Design to propose ideas and solutions for a Westerham masterplan, thoroughly informed by local people. Like all design team consultants, Rummey Design aims to deliver a standout service and manage risks responsibly. Engagement with all the different stakeholders in the area - from local businesses and scout groups to schools and shopkeepers - was critical to developing an emerging masterplan and including the community. An online engagement approach extends the reach, and enabled a modern participation in a controlled and efficient way. Gina Fellendorf-Perkins, Senior Landscape Architect and Urban Designer for Rummey Design, was already aware of Stickyworld software from Kent County Council’s continuing use and seemed the ideal engagement software choice for the job. Rummey Design have set up and run 7 successive public consultations on the Stickyworld portal. Each of these informs the next step in development of the Westerham masterplan. The first online consultation took place at end February/early March 2017 - ‘Which way Westerham?’ - asking for people’s initial feedback across a range of local issues. Issues included the accessibility of the countryside nearby to how to improve the town environment, roads and traffic, housing and schools. To stimulate discussion and feedback online, the team created a slideshow of images relating to issues. The content was added using Stickyworld’s simple editing tools. The team widely promoted the opportunity for people to get involved. Rummey Design printed business cards highlighting the link to the online consultation. These were shared at the face-to-face consultation events, in shops and meetings. Using Stickyworld’s commenting features it was easy for people to add their thoughts, respond and debate with each other online. The Rummey Design team were automatically notified when comments were left. They could manage the discussion with full moderation tools, stay in control of the conversation and respond appropriately. It was possible to see all the responses in a single, filterable view. When the consultation closed, it was quick and easy download a PDF of all the results, helping to inform Rummey Design's initial report. Later in March 2017, the Rummey Design team shared the initial report with people during a second online consultation - ‘Which way Westerham? Background report - work in progress’. This asked people for further suggestions and ideas. Stickyworld made it easy for people to view, download and leave comments about the report. As planning for the masterplan progressed information shared online has become more detailed and technical. Stickyworld’s interactive content tools have enabled the Rummey Design team to explain this information via a variety of media – photographs to PDFs of documents and maps. The ability to create landing pages with compelling images and engagement headlines has helped stimulate and encourage engagement. "We've fully utilised all of Stickyworld's tools to publish online consultations and attracting people's interest. At every step, Stickyworld’s support team have been there if we've ever needed any support and guidance." In the most recent online consultations run in Autumn 2017, the Rummey Design team have also utilised Stickyworld’s flexible configuration settings so the team was able to receive private comments, not visible to the public. The ability to enable private conversations has meant people who wanted to submit potentially controversial suggestions about the proposals could do so with the confidence that they wouldn’t be exposed to criticism. By using Stickyworld engagement software to run a succession of online consultations, Rummey Design engaged with the community. It has enabled people in Westerham to have a say in the early stage-by-stage development of the town’s masterplan and guide the way the town should go. Hundreds of initial comments gathered via their first online consultation informed Rummey Design’s emerging masterplan. Comments left in each of the following public online consultations have provided further feedback and clarifications. The portal has provided the means for people to access factual information 24/7. It has reduced the potential for misinformation, and for excluding views from people who may perhaps not have been able to make face-to-face meetings. Critically, there is also an enduring record and audit trail of people’s feedback. For Rummey Design, the ability to have the flexibility to set up online consultations for both public and private discussions has been key. Tools to manage moderation have provided confidence and enabled them to feel in control at all times. "Stickyworld has given us a way to be open and inclusive whilst still being able to closely manage and monitor engagement. It means engaging the community to formulate an emerging masterplan for Westerham and the next generation." 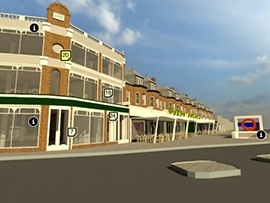 Rummey Design continues to use Stickyworld for the next stages of the Westerham masterplan consultation. If you would like to learn how Stickyworld helps you carry out effective online engagement on behalf of your client, book a demonstration with our team.